Our client suspected a damp problem within their semi-detached home in Barnet which was confirmed following our Surveyors visit. 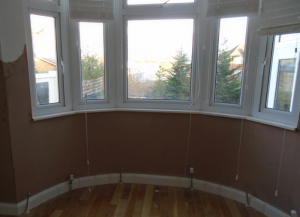 Rising damp was found to be affecting the bay window wall of the home. This problem was caused by a defect with the original damp proof course. This property was built in the 1930’s. To rectify this defect Kenwood has installed a new damp proof course. This is done by injecting the brickwork with a chemical damp proof course; the walls have also been re-rendered using our render containing additional waterproofing agents. This comprehensive treatment will ensure this wall with be damp free for many years to come.